A Californian couple wanted to make a statement and do something incredible yet memorable for their big day. James Sissom and Ashley Schmieder wanted to factor their adventurous spirit into their wedding plans and decided to combine taking their wedding vows, with a life-long dream. 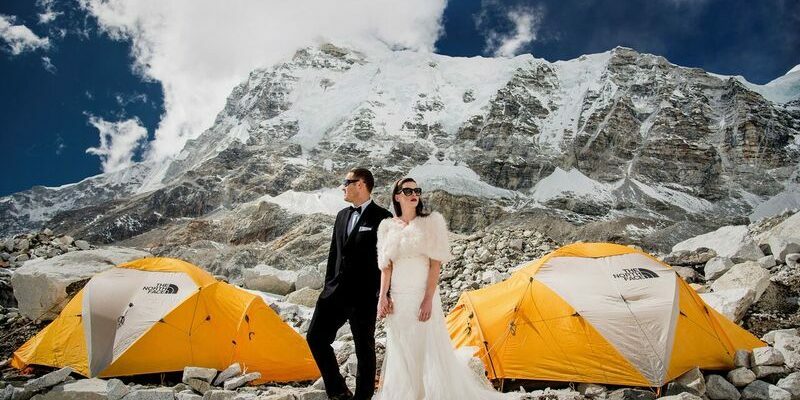 The loved-up pair travelled thousands of miles to the Himalayas in Asia, with the goal of climbing to Mount Everest Base Camp to tie the knot. Having spent months training for the expedition, the couple faced sub-zero temperatures and altitude sickness to reach their goal- around 17,000ft above sea level. ‘After much deliberation, we decided a traditional wedding was not the right fit for us. As much as we would have loved to share our special day with our family and friends, we were both drawn to the idea of eloping during an incredible vacation. Although an un-traditional wedding, they still were able to don traditional wedding attire- with James in a tuxedo style suit and Ashley in a figure fitting embellished gown with faux-fur shawl. 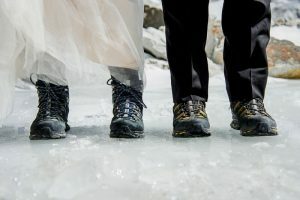 However, the couple still had to think practical of course, as underneath their suave wedding outfits; they had to wear hiking boots suitable to the conditions. Ashley had reached out to Charleton, after coming across his adventure wedding photography online and his desire to shoot a couple getting married on the epic mountain range. 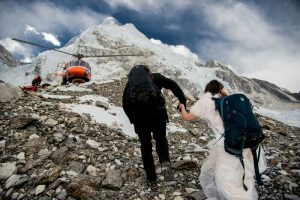 After it was suggested by Charleton to accompany them to get hitched on Mt Everest, the couple immediately seized the opportunity and began training. Although weddings are usually a large family affair, James and Ashley made sure to keep loved ones and family ‘in the loop’ for the big day- with Charleton regularly posting updates on social media and recording live streams over the three-week trek. However it seems it was all worth it for the couple, as they got married on March 16, 2017 in the most outstanding, beautiful location allowing for breath-taking scenery and photography.